Diesel car owners could get some help from the government if cities adopt new charges to tackle pollution, Theresa May has suggested. An ultra low emission zone will come into force in London in April 2019, with a £24 a day fee for some drivers. A so-called "toxin tax" of up to £20 a day is also expected to be rolled out to several other UK cities. The government was forced to act by a High Court judge after losing a legal battle with lawyers ClientEarth. It came after the UK got a "final warning" on air quality from the European Commission. One road in Brixton, South London, hit its permitted annual pollution level in five days. Owners of diesel cars - who were encouraged by previous governments to buy them as they were thought to be more economical and less harmful in terms of carbon dioxide emissions - have expressed anger and confusion at the move. Former Labour Chancellor Gordon Brown introduced a lower vehicle tax for diesel cars in 2001 - but there has been increasing concern that they emit dangerous levels of nitrogen dioxide, which is thought to cause thousands of premature deaths in the UK. London Mayor Sadiq Khan announced on Tuesday that from April 2019 there would be a £12.50 charge - on top of the existing congestion charge - in central London for petrol cars that do not meet Euro 4 standards and diesel vehicles that do not meet Euro 6 standards. According to City Hall, this will hit most petrol cars more than 13 years old in 2019, and diesel cars more than four years old in 2019. In 2015, former Labour science minister Lord Drayson said Tony Blair's government made a mistake in promoting diesel cars because they were now "killing people". 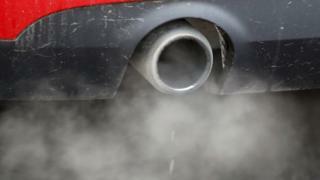 Motoring organisations have said diesel car drivers are being "punished" for following a previous government's policy. And Mrs May has now hinted there will be schemes to help drivers who were told that diesel vehicles were the right purchase. She did not set out any specific plans, but there have been reports of a scrappage scheme that could pay people to get rid of their diesel vehicles.